Cuimhneamh an Chláir, as part of its attempt to raise awareness and interest in Clare's folklore and oral history collaborated with Clare FM in a unique poetry project. The project, which received funding from Oifig Gaeilge an Chláir, involved Cuimhneamh an Chláir, working with pupils from 6th class in Gaelscoil Mhichíl Cíósóg. The pupils were asked to compose poems on characters of their choosing relating to Clare folklore and history. 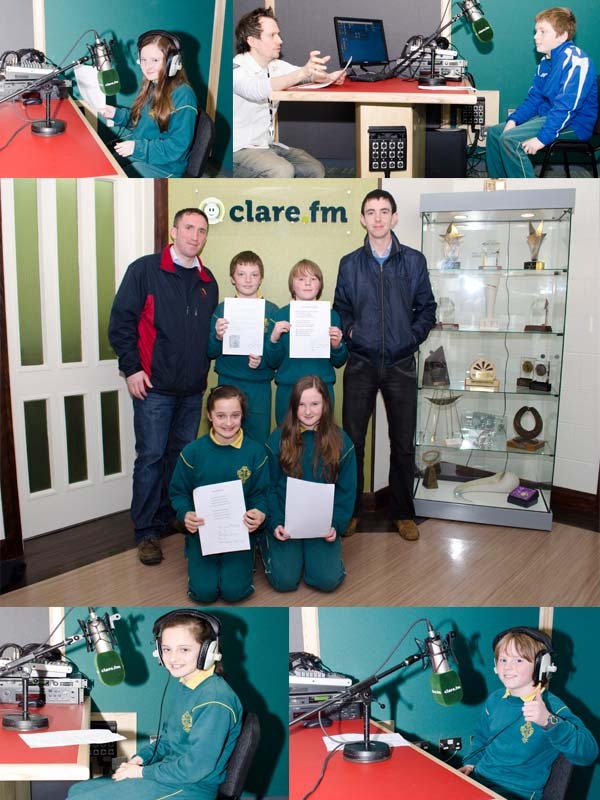 Although all entries were fantastic and included many key figures in Clare and Irish history, four pupils were selected to be taken to Clare FM studios, where they were professionally recorded reciting their poems as Gaeilge. The poems selected include celebrations of many unsung local historical heroes and Clare folkloric figures. Micheál Ó Braonáin or Michael Brennan was a native of Meelick and was one of three Brennan brothers who took a leading role in Clare and Ireland's fight for Independence during the Irish War of Indpendence. In the poem, Ruairí Ó Braonáin outlines how Micheál fought against the Black and Tans and led the East Clare Brigade. Eoin Ó Ceallaigh writes a poem about Mairéad Ní Ghrada, a Poet, Playwright and Broadcaster from Kilmaley. She was a life long advocate of the Irish language and in the poem Eoin Ó Ceallaigh oulines her life story. Rebecca Ní Dháibhis' poem is about the great Tulla and Clare hurler Tommy Daly. The hurling pitch in Tulla is name for Tommy Daly in recognition of his great prowess as a hurler. He won an All Ireland junior hurling medal in 1914 and a Munster championship with the Clare Seniors in 1932. Rebecca's poem celebrates Tommy Daly the hurler. Kitty Linnane was a founding member of the Kilfenora Céilí band. Her contribution to traditional Irish music is celebrated in this poem written by Erin Ní Aichir.